Some summer days just beg for easy cooking, and this past week was full of them! Sometimes serendipity intervenes and provides you with what you need. At a race I ran last week, one of the vendors was giving away yellow tomatoes. Tomatoes!!! So we came home loaded down with little packages of delicious tomatoes, just in time to make a dish that is summer simplicity at its best. Italian cooking makes the best use of simple, ripe, seasonal foods and this dish is one of my favorite ways to get our pre-run carbs without turning the kitchen into a sauna. 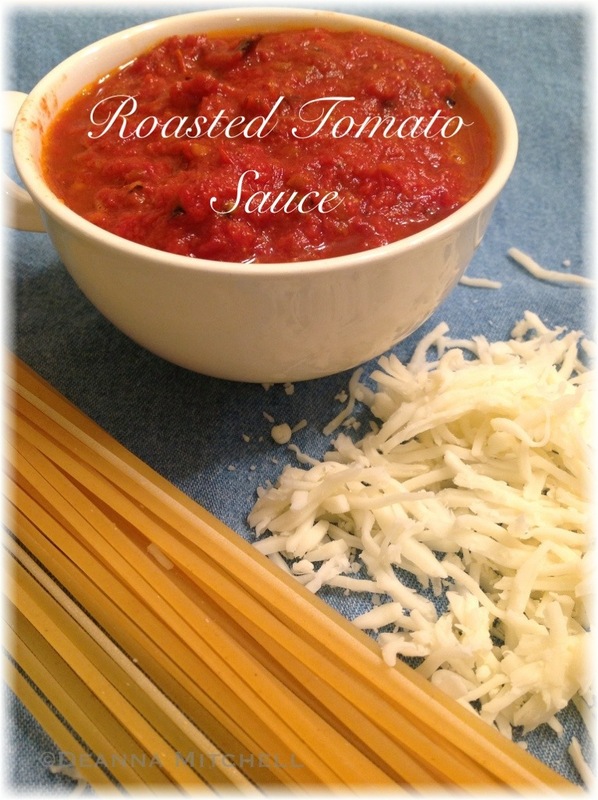 The sauce is a raw tomato sauce that is flavorful and satisfying without being heavy. Tossed with hot pasta, it fills your kitchen with the amazing aroma of basil and garlic. 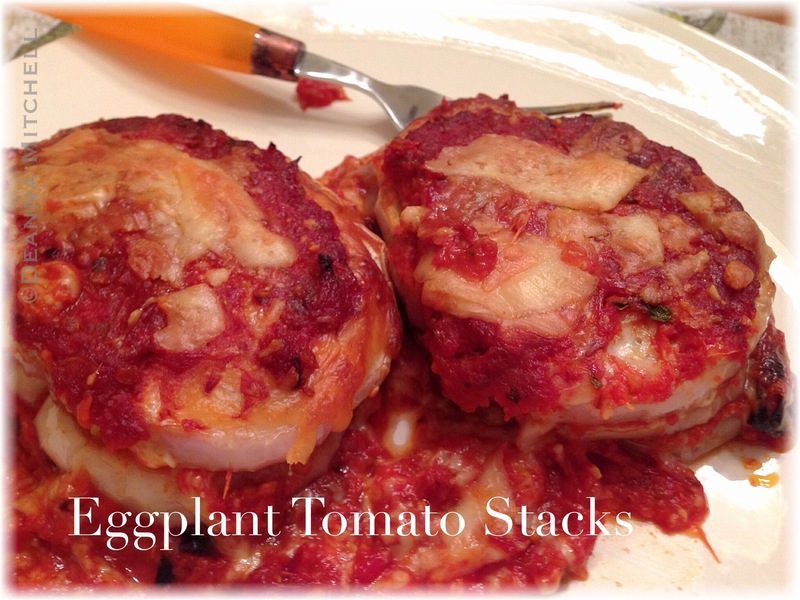 Try this with your best, ripe summer tomatoes! 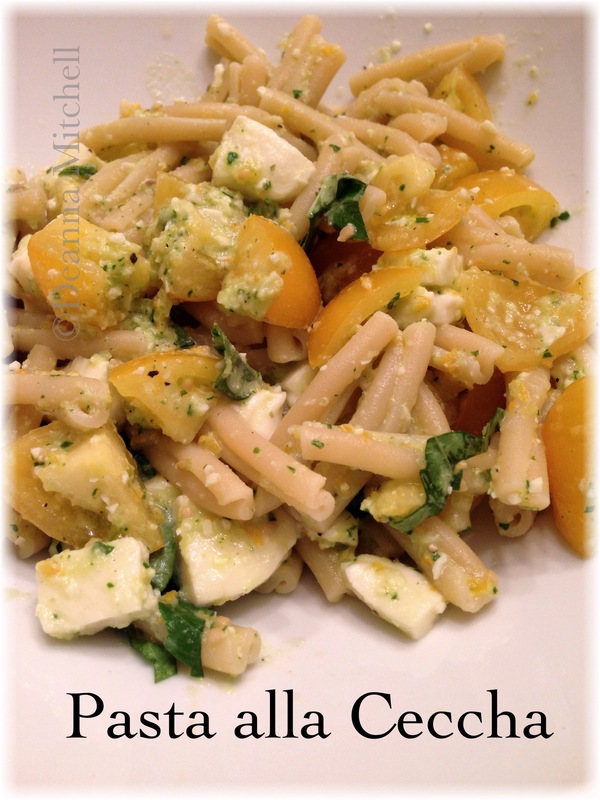 This recipe is based on one from Giada deLaurentis and is a favorite summer staple. Cook pasta according to package directions to al dente. In a food processor, combine all remaining ingredients except mozzarella. Pulse until all is combined but still chunky. Don’t puree ( although if you do, it’s not the end of the world). Toss the sauce with the hot cooked pasta. Add the fresh mozzarella and serve immediately. It’s been a long, crazy summer for us, and I am finally getting back to posting. Actually, I’m finally getting back to cooking, which means I finally have something (anything) to post!!! I feel as though I am emerging from a period of great darkness, into a beautiful sunshine-y day. So, cheers to new beginnings, great friends and daily miracles. Speaking of miracles, this has been an amazing summer for tomatoes in North Carolina. We’ve had plenty of rain (but not too much), lots of sun and warm (but not scorching) temperatures. Tomatoes are rocking our world this summer! If you check the popular lists of superfoods out on the internet, you may not find tomatoes on the list, but they should definitely be there. Chock full of vitamins and lycopene, tomatoes are little powerhouses. What is lycopene? Lycopene is an antioxidant in the carotenoid family and may help protect the body from prostate and breast cancers as well as protect the blood vessels around the heart. While lycopene can be taken in pill form, it is most highly effective when eaten in cooked tomatoes. Cooking tomatoes breaks down the plant fiber and releases lycopene in a form more easily absorbed by the body. This dish is pure, summer simpleness, although it does involve turning on the stove–not my favorite thing in the hot summer–but it is worth heating up the kitchen a bit. 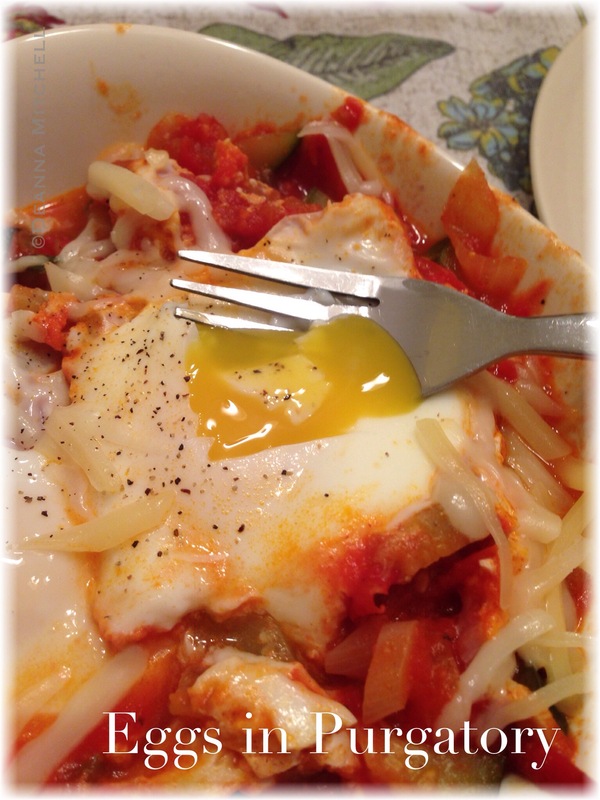 The tomatoes, zucchini and onions are stewed down until very thick, then topped with eggs, covered and simmered until the eggs are done to your liking. Voila! Totally good for you, with a bit of protein and a hit of spicy. This version is a takeoff of an Italian breakfast dish and the “purgatory” in this case comes from red pepper flakes and sriracha chili sauce. This combination of tomato and eggs, however, has variations in Middle Eastern, Jewish and Chinese cooking as well, so it has been around (and loved) for a very long time. We had this for supper and it was delicious. You could add other vegetables as you like and experiment with new combinations that work for you! I want to try this with some freshly roasted red sweet peppers for more of a smoky flavor! In a large, deep saute pan or non-cast iron skillet, heat the olive oil over medium heat. Add the chopped onion and saute for about 5-6 minutes or until onions begin to soften. Add the tomatoes to the pan, stir well, and cook over medium heat for about 20 minutes. Check on the tomatoes frequently. If they are scorching, turn the heat down to medium low and continue to simmer. Add the diced zucchini, salt, pepper and red pepper flakes. Stir well and simmer for about 15-25 minutes or until most of the liquid from the pan has evaporated. This could take longer depending on the heat of your stove, your pan, and the amount of water in the tomatoes. Drizzle the tomato mixture with the sriracha, add chopped, fresh basil and stir. When the mixture is very thick, use a spoon to make 4-6 small nests in the tomatoes. Crack one egg into each nest, cover the pan and simmer until the eggs are cooked to your liking. Check for seasonings and serve immediately topped with cheese and with warm bread on the side for dunking! Can you tell we love shrimp? A good number of our summer recipes revolve around shrimp and fish, both of which are available fresh from North Carolina waters. Shrimp has had a bad rep for its high cholesterol content, but interestingly, it is high in natural cholesterol and very low in fat. Studies of the effects of shrimp on cholesterol levels have shown that unlike high cholesterol, high fat foods, eating steamed, poached or roasted shrimp do not negatively impact bad cholesterol levels. Great news! Just stay away from the all-you-can-eat fried popcorn shrimp at Golden Corral. Nothing good comes of that. This shrimp dish is unbelievably flavorful and fresh, and it comes together in about 30 minutes! The original recipe is an oldie from Southern Living, but I’ve added my own spin to it. We served this over organic rice, but pasta would be great as well. 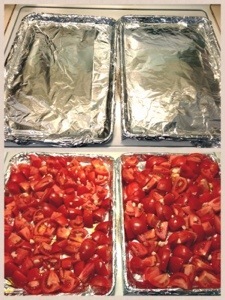 Line a rimmed sheet pan with foil. Combine the first 6 ingredients in a bowl and toss well. Add to baking sheet and roast in the oven for 15 minutes. Stir vegetables gently and add shrimp and artichoke hearts. Roast for 10 more minutes. Combine feta, lemon juice and parsley in a large bowl. 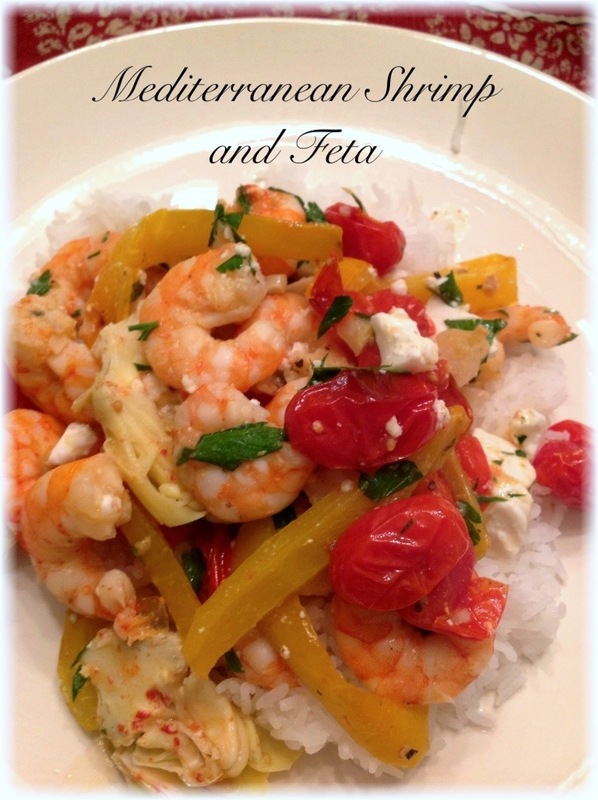 Add cooked shrimp mixture and any pan juices to the feta. Toss well. Even though it is still in the 90s outside, I needed a change of pace from all the cold salads we have been eating. 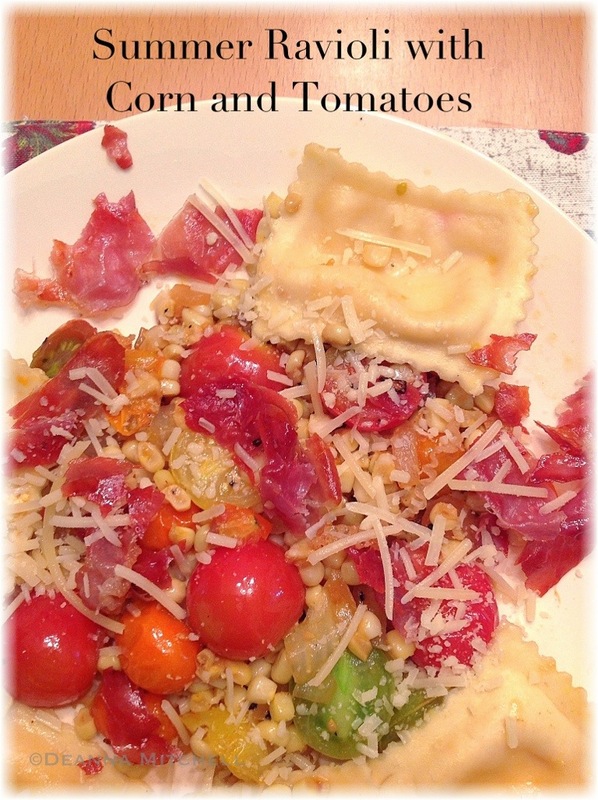 We had some frozen pimento cheese ravioli from local pasta maker Melina’s Pasta, so I concocted a new recipe using that wonderful ravioli and some fresh corn, sweet onion, garlic and cherry tomatoes that came in our Produce Box. The result? We will definitely make this again! You can use any cheese stuffed ravioli, it doesn’t need to be pimento cheese (although that was pretty terrific). Definitely add the crispy prosciutto if you are not vegetarian–it really brings everything together. Being a large pot of salted water to boil for pasta. While water is coming to a boil, shuck the corn and use a sharp knife or a corn scraper to remove the corn from the Cobb. Set corn aside. Wash cherry tomatoes and cut each tomato in half. Set aside. Heat the olive oil in a large sauté pan over medium heat. When oil is hot, add the prosciutto and cook until crispy and slightly browned. Remove to a paper towel lined plate and reserve. Add the ravioli to the boiling water and cook according to directions, about 7 minutes. While ravioli is cooking, add the onion and garlic to the hot sauté pan and cook until soft, but not browned, about 2 minutes. Add the corn and tomatoes to the pan and sauté for about 4-5 minutes. Stir frequently and season to taste. Add the cooked ravioli to the sauté pan, toss carefully to coat the pasta. Plate the pasta and vegetables, topping with crumbled prosciutto and Parmesan cheese. One of my Girl Scouts keeps joking that she needs to bring her Staples Easy Button when we’re working on projects. Wouldn’t it be nice to really have an easy button when things get difficult? Well, I’m going to give you an easy button right now, although you’ll have to wait until summer to use it. This is by far the best–and easiest–tomato sauce I have ever made. I froze quarts and quarts of this over the summer and we have been enjoying it all winter long. It is so thick that it looks like a Bolognese sauce, but it has no meat at all. in fact, it only has four ingredient: tomatoes, garlic, olive oil and salt. See? Easy! While working on my canning over the summer, I also canned some marinara sauce. This took for.ever. I cooked my tomatoes down for hours and hours, but my sauce still ended up thin. No worries though, because it is now called “tomato soup” 🙂 Nothing that a little spin couldn’t cure! After that experience, I almost gave up canning my own sauce. 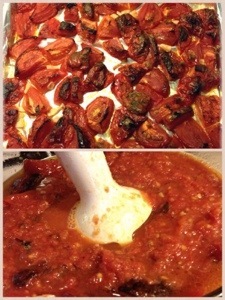 Then I tried this recipe for a roasted tomato sauce. Just roast, purée and freeze. Howeasyisthat? And it is so good that I could (and have) eaten it plain in a bowl. Sprinkle garlic pieces and salt over tomatoes. 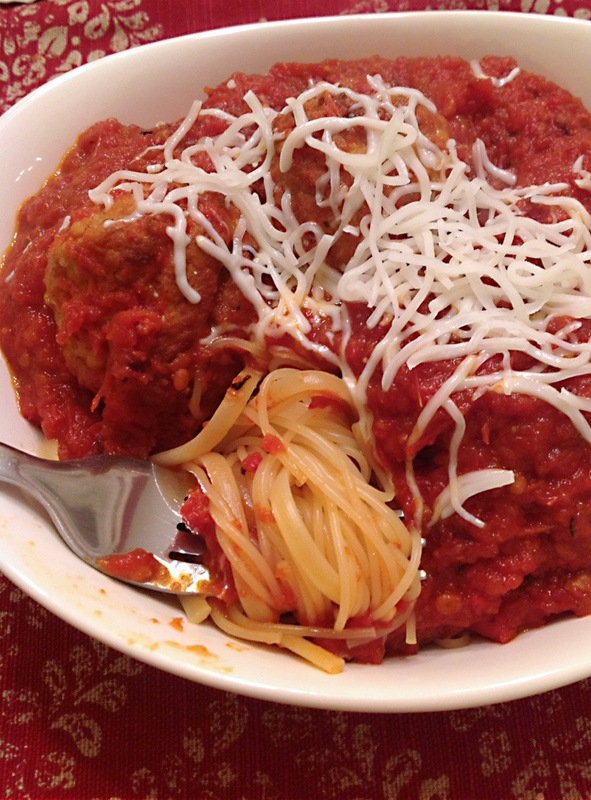 Roasted tomato sauce with pasta and turkey meatballs!